Free Video Converter by Extensoft is a powerful application that offers quick and easy video conversion and movie editing. With this Free Video Converter, you may convert, merge, split and edit your movie files quite easily. It comes with a user-friendly interface using which you can effortlessly execute your basic conversion jobs. Free Video Converter supports a wide range of video formats as well as high definition movies which are captured using latest HD cameras. You may also join and split movie clips and perform batch conversion of movies in a single step. Supports latest high-definition H.264 high quality format and offers multi-pass conversion for enhanced quality allowing you to create high quality movies at smallest size. Has the ability to open and convert from various file formats including FLV, AVI, MOV, MPG, MP4, MPEG, RM, MTS, RMVB, WMV, QT (QuickTime )and many others that are supported by your system. The Interface is simple and easy-to-use and has a timeline, movie preview area, editing area and video-clip management area. 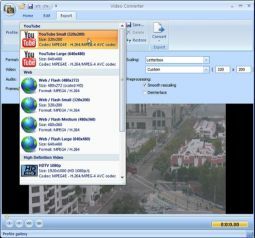 Has an ability to convert to the output formats such as MP4, AVI, MPEG1, MPEG2, WMV and QT (QuickTime). Can save custom conversion settings. Supports batch mode which allows quick conversion of multiple movies/selections to one or many output files. Allows you to select movie sections and split and merge multiple videos. Offers predefined conversion settings which help you make instant conversion to various movie formats which are supported by iPod, iPhone, YouTube, Web pages and HDTV. Supports movie resizing or scaling, deinterlacing and altering frames-per-second. Able to create HTML pages for playing converted videos in the form of Flash movies (FLV) to make it simple to publish to the web. Allows you to save and load movie conversion projects.